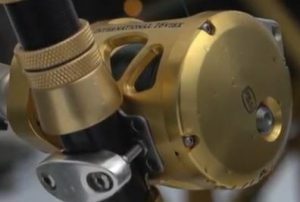 Penn holds the name as an American staple in fishing reels for as far back as many can remember. Synonymous with the name Penn is their International line of reels, perhaps the most popular of all their models. Ownership of a Penn International offers an experience unlike most other reels. They start at a higher asking price, but the return is ten-fold. If you don’t mind paying for a lifetime of use in a top performance reel, Penn International may be the answer. 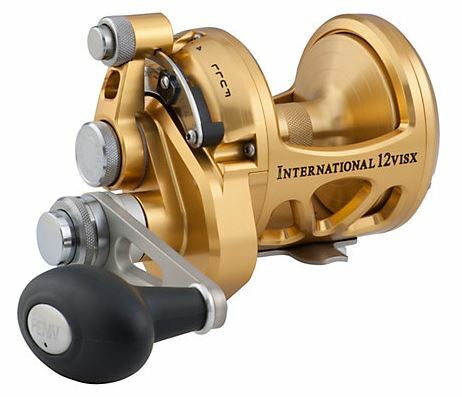 Product: Penn International VI, VIS, VISX, & VISW Reels. Overall Ranking: 94 out of 100. Price: Middle to High Range. The development of Penn International reels begins back in 1966 upon manufacturing of the very first model, and it continues today. Penn’s current selection of International reels breaks the line down into four categories. You’ll see these as Penn International VI, VIS, VISX, and VISW reels. While it’s proper to classify these as categories, they each have different size models to offer. Penn International reels, however, share the same features. In essence, all reels can classify as International models. Each model has a different size and function in the world of offshore fishing, despite their shared features. Taking a look at the model numbers, you might notice that the letter S alternates on and off the endings. Penn International reels come with the option of gold or silver anodized aircraft grade aluminum frames. When the S appears at the end of a model number, it signifies the silver anodized reel. The Penn International VI offers 3 different size models, the only International models that use a single speed system. The smallest INT12VI has the fastest gear ratio out of all International models at 6.75:1. Holding 1510 yards of 10-pound mono, the smallest of the VI category is a light line wonder. For braid, it rates at 985 yards of 40-pound strength. A weight of 31 ounces isn’t bad for a lever drag reel that can hold that much line. At the larger end of the models is the INT50VIW which weighs in at 66 ounces. Capable of holding 1110 yards of 200-pound braid, it’s a reel more than suitable for offshore trolling. All VI International reels use a 5 bearing system. The smallest models are fast, though the largest drops down to a 3.5:1 gear ratio. The middle size 30 model offers 4.1:1. Drag resistance starts at 15 pounds max in the size 12, 30 in the size 30, and a powerful 45 pounds in the size 50 International VI reel. Penn International VIS reels offer the 2-speed gear train and the largest of all models in the INT130VIS. They are also the most expensive out of all Penn International categories. Starting small, you have the INT16VIS. Capable of holding 1035 yards of 16-pound mono and up to 770 yards of 20-pound mono. The only midsize reel in this category is the 70 and it jumps way up to 50-pound mono on the light side. It’s capable of spooling 1085 yards of that 50 mono and up to 685 yards of 80-pound mono. The largest VIS reel is the 130. Going light means 1330 yards of 100-pound mono or top out with 870 yards of 150-pound mono. Penn International VIS reels may use lightweight aircraft grade aluminum for their frames, but they aren’t light. 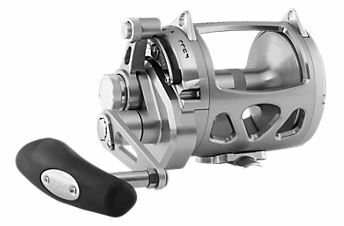 The small size 16 VIS reel weighs 36 ounces, the size 70 weighs 74 ounces, and the 130 weighs 169 oz. Maximum drag capacities also follow the reel sizes at 20-pounds, 55-pounds, and 100-pounds respectively. When it comes to gear ratios, the smallest reel is the fastest at 5.2:1. It drops down to 1.6:1 in low gear. Next is the Penn International VIS size 70. It’s not as fast in high speed at 3.1:1 and it drops to 1.5:1 in low gear. Last is the 130 which brings a 2.3:1 gear ratio in high speed and drops down to 1.1:1 in low gear. All Penn International VIS models use a 5 bearing system and double dog ratchet anti-reverse. With reel sizes that range from size 12 to size 50, the VISX category allows for both trolling and free rod fishing. Midsize models of 16, 20, and 30 fill in the category offering plenty of choices. Anglers may also appreciate the lesser cost in comparison to Penn International VIS reels. Starting small, the INT12VISX is the smallest of the Penn International 2-speed models. On the light end, it wraps 1510 yards of 10-pound mono and goes up to 880 of 15-pound mono line. Compare that to the size 16 which spools 745 yards of 20-pound mono or 280 yards of 60. That’s a pretty big jump. Next in line for size is the 20 which on the light end spools 490 yards of 40-pound mono. It’s capable of holding 325 yards of 60-pound monofilament line. Move up to the size 30 VISX model and you can spool 590 yards of 40-pound mono or up to 390 yards of 60. Reaching the size 50 model brings us to the largest VISX reel which holds 870 yards of 40-pound mono. At the top end, it’ll carry 575 yards of 60-pound mono. Penn International VISX reels weigh between 32 and 63 ounces. 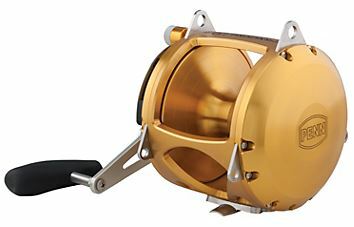 The max drags on these reels is enormous and starts at 40-pounds in the smallest model. You’ll get 60 pounds of max drag resistance in the largest size 50 VISX reel. Gear ratios start at a decent speed of 5.1:1 / 1.8:1 in the smallest model and slow as reel sizes increase. The largest size 50 VISX model gives a ratio of 3.5:1 / 1.3:1. The Penn International VISW category contains three different size models. There’s some overlap between the two smaller VISW size 30 & 50 reels, and the same size reels in the VISX category. You’ll see that the spools on VISW reels hold a lighter line and a lot more of it. Penn International VISW reels are heavier than their VISX counterparts. The smallest size 30 VISW model weighs 90 ounces and the heaviest size 80 weighs in at 113 ounces. Spool specifications in the VISW 30 & 50 models are the biggest differences from the VISX category. Instead of starting with 40-pound mono at the light end as the INT30VISX does, you get 1385 yards of 20-pound mono on the INT30VISW. It holds 800 yards of 40-pound mono as its maximum threshold. The middle size 50 VISW International reel begins its line capacity with 1185 yards of 40-pound mono. It tops out at 780 yards of 60-pound monofilament. If 60-pound mono won’t do for the monsters you’re after, the size 80 holds 1565 yards of 60-pound mono and maxes out at 965 yards of 100-pound mono. Going over the final specs of drag capacity and gear ratio, let’s again start small. The size 30 offers a max drag of 30 pounds. In high speed, it has a gear ratio of 4.1:1 and drops to 1.4:1 in low. Moving to the middle size 50 VISW reel, it has a max drag of 45 pounds. High-speed gear ratio falls a bit to 3.5:1, as does low gear at 1.3:1. Last but not least, the largest size 80 reel has a max drag of 65 pounds. 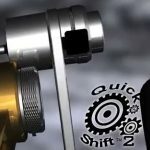 Its gear ratio in high-speed slows to 3.1:1, but low gear comes back up a bit to 1.5:1. Note: All Penn International Reels Rate For Braided Line. Specs Are Available On PennFishing.com. Penn International reels make it easy for the consumer when it comes to understanding their features. Some manufacturers change the features of reels within the same line, making it tough to keep up with the differences. Not so with Penn International reels. The four categories of International reels offer different size frames and spools, but the features remain constant. Even Penn International VI reels have all the same features, minus the two-speed ability. Penn cuts the frames and side plates of International reels to perfection using aircraft grade aluminum. Whether you prefer your reel color in silver or gold, all Internationals come with an anodized finish to protect against the elements. Anodization is a key ingredient which adds to the extreme durability of Penn International reels. One of the reasons Penn International reels weigh a little extra is the huge gear train. Despite the lightweight aircraft grade aluminum frames, extra large stainless steel gears add some ounces. Penn features the fact that both the main and pinion gear are stainless steel, another quality that adds to durability. Penn trademarks their Dura-Drag system which they design into all International models. The claim to fame of the Dura-Drag system is hesitation-less startups. Once enough force on the line builds to your drag setting, the drag will easily release. Some drag systems do very well in applying resistance according to the setting, but they can stick at startup. It’s a potential breaking point when fighting powerful saltwater species. 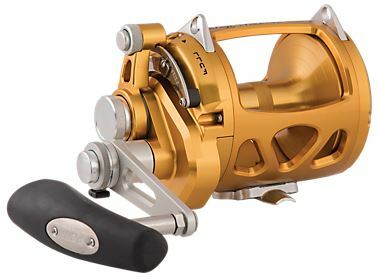 Penn International reels offer a design which they call the Versa-Strike. Along the line of the lever drag’s course are detente settings. The lever system does have strike & max settings, guides to show placement, and a precision adjustment knob. Some manufacturers prefer using an anti-reverse bearing to keep the engaged spool from spinning backward. A good example of this lies in the Shimano Trinidad. Other reels, like the Okuma Andros, use both an anti-reverse bearing and a dog system. Penn International reels use a double dog ratcheting system to hold the spool in place and support the drag system. Penn designs what they call Line Capacity Rings on the inside walls of the spool. Each Penn International reel comes with these rings, and they serve a couple of purposes. First, when a feisty tuna or sailfish starts peeling off yards of line, the Line Capacity Rings give you an indication of how much line remains. Second, if your standing line drops below that upper Line Capacity Ring, it might notify you that it’s time to re-spool. Penn International reels offer a two-speed system in all models except those in the VI category. Having the option to retrieve line quickly in high gear, then drop to a powerful low gear when fighting strong fish provides an incredible advantage. Penn International reels offer a solid two-speed system with a decent spread of gear ratios. A simple push of the button at the base of the handle switches between high and low gear. Penn does a lot right in the current design of International reels. After all, years of working out the kinks tend to show through. The two most appealing draws as a consumer are the durability and performance of Penn International reels. With proper maintenance, as is so with any reel, Internationals will last a lifetime. As for performance, one can’t honestly find any big drawbacks. High performance and super durable reels usually mean a deeper dig into the pocket up front. You might save in the long run, but it doesn’t necessarily make the price tag easier to swallow. So it is with Penn International reels. Other drawbacks might include the lack of an anti-reverse bearing. Some anglers prefer having both ratcheting anti-reverse and an anti-reverse bearing. Other anglers don’t care for the back play of the ratcheting dog system and would prefer to only have the anti-reverse bearing. The dual dog anti-reverse of the Penn International is better than a single dog but lacks the anti-reverse bearing. The final drawback that anglers might speak of has to do with the application. Even the smallest Penn International models can be too much for an angler’s needs. Inshore saltwater fishing often doesn’t demand such a high-performance reel. Which Anglers Benefit Most From Using Penn International Reels? Notice that there is a lack of high-speed gear ratios in any except the smallest Penn International models. That fact and not having a narrow spool option makes Penn International reels less than ideal for casting. One could do it better with the smaller reels, which offer a light line to big game capability. The true magic of Penn International reels shines when fighting big game in open water. For your trolling purposes, you won’t go wrong with an International. If you enjoy tempting big species by letting bait out on a fly line, the Penn International will impress you. It’s unfortunate that Penn doesn’t offer a lifetime manufacturer’s warranty on at least the International line. They come with the standard 1-year warranty that all Penn reels have. If you don’t plan on using the reel for a while, you might want to hold on your purchase. On the other hand, it might be hard to pass up if you find a deal. Penn support does do fine work in customer service. International reels are also well known and easy to maintain. Overall Ranking: 94 out of 100 anglers approve of Penn International Reels. Penn stays consistent in their International line of reels with a simple yet highly effective design. There’s isn’t a ton of fancy features, just strong mechanics in the ones they choose. Put the resistance of the Dura-Drag system to use with enough line to wear any fish out. When it’s time to change the odds, drop into low gear and apply the extra large stainless steel gear train. In that moment, you’ll never look back from Penn International reels. The Penn reels sound like they are extremely durable and perform great when fishing for large fish. I don’t have a need for a reel that holds 1000+ feet of line though. 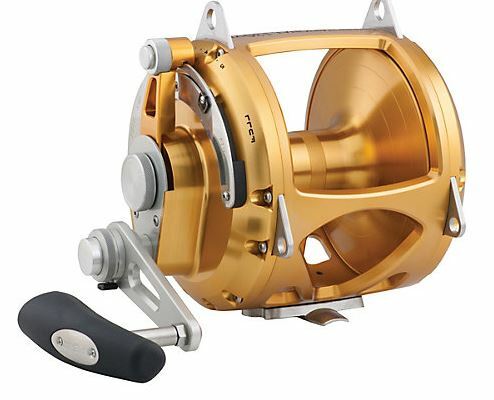 Is there a reel that you would recommend that has similar durability to a Penn real, but is more suitable to fishing in coastal and inland waters? Absolutely. If you like Penn durability and performance, go with the Fathom. That’s the reel I use and I love it. Yea P HOLLAND! Love the enthusiasm! I spent a few minutes poking around for info on the VS70. My favorite source for learning about drag tension is Alan Tani, short of being able to handle the reel with a fish on. He’s been doing drag tests on different reels and testing their different settings. Low tension, strike, full, etc. Unfortunately, it doesn’t look like he’s done the 70 yet. The link to the info on his site is here. Tight lines with pissed off Wahoo! Geoff.